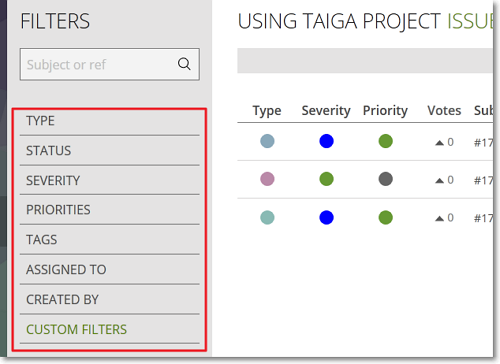 To filter the list that shows the existing Issues for the current project you can use the available filtering options displayed in the FILTERS section of the Issues module; this section is located on the left side of the list. Click the name of the filtering option (TYPE, STATUS etc.) you want to use. This action shows the criteria you can select for that filtering option. On the right side of a criterion, you can view the number of matching Issues. Click the criteria you want to use. 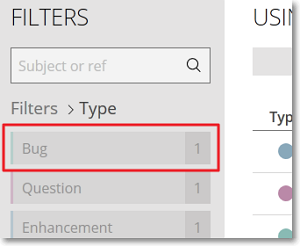 This action adds those criteria to the selected criteria list and automatically filters the list that shows the existing Issues. Note: To remove a criterion from the selected criteria list, on the right side of that criterion, click . 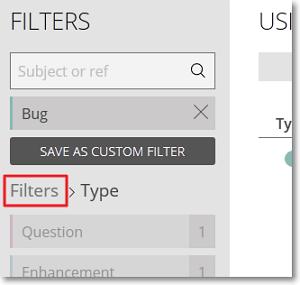 To return to the list that shows the available filtering options, above the list with available criteria for the currently selected filtering option, click Filters. Note: You can select criteria from several filtering options. However, if, after you select those criteria, you select a custom filter, all the previously selected criteria are removed and are replaced with the criteria of the selected custom filter. In addition to filtering the list with existing Issues, you can also search for specific Issues based on Issue number or Issues subject. 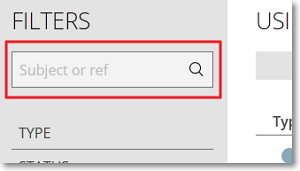 To do this, in the search box displayed in the FILTERS section, enter an Issue number or subject (or a part of an Issue number or subject) – this action automatically shows the updated list with existing Issues based on the results.